After the chat today, I spoke to Lisa Gibson on the telephone about how fun this Twitter chat was. I am truly excited to say that we are talking about a weekly Makeup / Fashion twitter chat! What is your favorite makeup and makeup tool(s)? All of us have our favorites and some of us use a combination of brands, while others are loyal to all one brand. I have to agree with Mindy. I don't go on stage or in front of a camera without my Mac foundation! And, great advice from our Pro, Lisa Gibson, on makeup brushes from the art supply store! What are your biggest challenges with makeup and makeup application? We all have challenges or things we would like to improve. A couple of those highlighted during the chat include trying new things, time, the eyes, blending, and more. If only we had more time to address all of the issues! 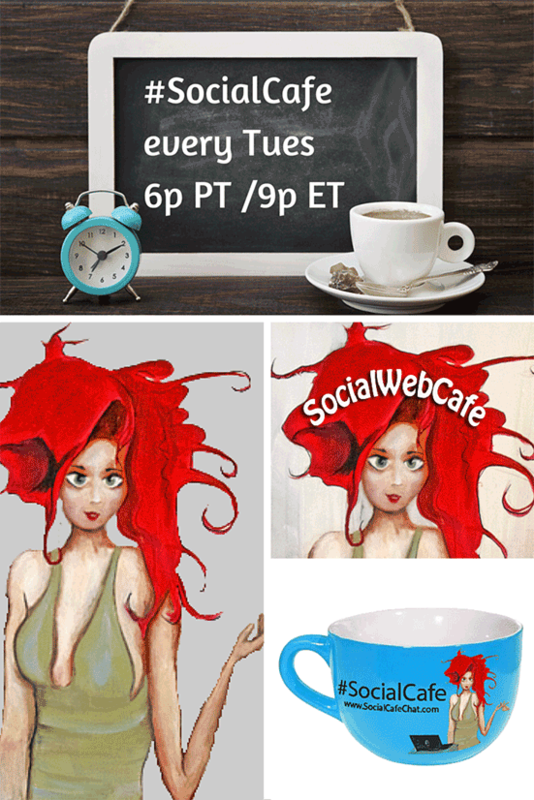 See, aren't you glad we will have a weekly #SocialCafe twitter chat where you can discuss just that? Again, tentatively, every Thursday at 5pm PST / 8pm EST. How do you shop for makeup? Favorites? One shopping tip, above, was to buy your brushes at the art supply store: Same quality, lower price. Lisa recommends that you change your way of thinking and that it is truly ok to NOT spend a million dollars and yet, you can still LOOK like a million dollars. What do you do different during holidays or parties? The holiday season is upon us and many of us women want to get a jump start on what to do for our makeup for all those fun parties (or, just for us and our special loved one, in front of the fireplace with the cup of chocolate). Like Scherrie said, "Glam it up!" Lisa shares tips on just how to do that and get maximum glam and beauty, without overdoing it and looking like a clown. BTW - I, Deborah, got so excited that within 30 seconds, I was buying the "Midnight Cowboy" that Lisa recommended. I can't wait to receive it and try it out for the holidays. I am not an affiliate or representative of the Urban Decay and neither is Lisa. We just love makeup and makeup tips! Lisa is all about helping women to look good, for themselves, for others, and to feel good, as women. I am so thrilled that she is willing to share with us on this chat and chats to come. Lisa also has a great pro application makeup brush that she has invented and it is very affordable (when it goes to market). I can't wait to try it out! Commun.it - Relationship Management For Twitter that Makes a Difference. Community Management & Lead Generation for Twitter. During the holiday season #SocialCafe is "giving back" and chatting about gift ideas and, today, holiday party makeup. Missed the #SocialCafe chat? Stay tuned for Tweets letting your know the archive/summary is ready. Thank you for joining us for this week's #SocialCafe Twitter Chat. This SocialWebCafe Twitter Event is about Makeup Tips and Tricks for the Holidays. SocialWebCafe and the #SocialCafe twitter chats are doing something special this season and "giving back" by promoting entrepreneurs and product specialists. The idea is that we give some promotional help (having a Twitter Chat) and give our Tweeps some ideas for the holidays and especially gift ideas for those hard-to-buy-for-people in your life. To kick it off this season, we will start with looking good and getting ready for those holiday parties and get-togethers. During this #SocialCafe Chat we will have Lisa Gibson, a professional Hollywood Studio Makeup Artist, joining us to answer your questions about makeup and makeup application. Ms. Gibson will share how to find makeup that will help you to look like a celebrity at a fraction of the cost. She will also share those tips and tricks that even you can do, to look glamorous this holiday season. Ms. Gibson will point out the common misconceptions and pitfalls and also answer your questions, so start pulling those questions together now.